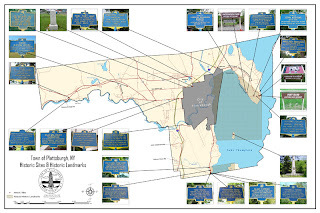 Jackson was slave in Maryland before fleeing to Ithaca, where he joined others he had known from the South. He was a reliable worker in E. S. Esty’s tannery and at the end of the Civil War he returned to his birthplace to bring his elderly mother North to live with him. The two died in 1889 five days apart: he was 75 and she was thought to be 103. A stone has been placed to mark her resting place and the plot has been landscaped. The second family grave is that of the Brum family where there are five stones, the major monument located this past fall was in three pieces, the larger spire down the hill, its writing mostly obscured. The City of Ithaca Department of Public Works reassembled the monument which when cleaned revealed two sides with writing. One is for Titus Brum, an African American born in N.Y. He was also a landowner and patriarch of the African American community in Ithaca. Brum led efforts to gain political recognition for black men in the 1820s, he organized the 1827 Fifth of July celebration, and organized a committee against the Fugitive Slave Act. His home was often the site of social and political meetings. The second side of the plinth commemorates his son Ira T. Brum who fought during the Civil War in a NY white regiment enlisting from Cortlandville in 1864 and who died of disease the day after his company was mustered out of the war. Below that there is also a notice about Fred.k W. Brum, who also fought in the war. Nearby there is a small grave for an infant named Clarence, and one for their sister, Mary Brum Johnson who links the Brum family with the Johnsons who were involved with aiding Freedom Seekers fleeing through Ithaca. The final two modest stones are marked I.T.B. 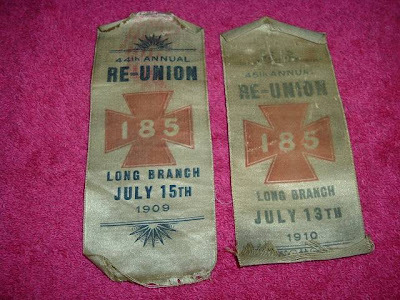 and F.W.B., stones set at the time of those men’s deaths. There is no notation for Eunice Woods Brum who most likely, with her son-in-law George Johnson, erected the large monument upon the death of Titus in 1881. Why hold this ceremony on the Fifth of July? For the very reasons that Frederick Douglass gave in his 1852 oration &#8220What to the Slave is the Fourth of July?&#8221 In Tompkins County we hope to recognize these mostly forgotten families and the goal of equal access to our political, social and economic life for all, and to think about goals yet unmet. The Mayor of Ithaca Sevante Myrick will speak at the ceremony, as will The Reverend E. Alex Brower of the A.M.E. Zion Church- the co-chair of the Civil War Commission the Hon. Michael Lane, and the County Historian. The ceremony will be held at 6 pm, rain or shine but not in thunder or lightening. All are welcome. 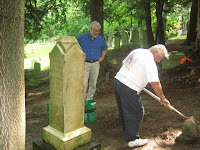 Photo: Volunteers clean and landscape the Brum family plot. Peter Feinman: What Can You Do? 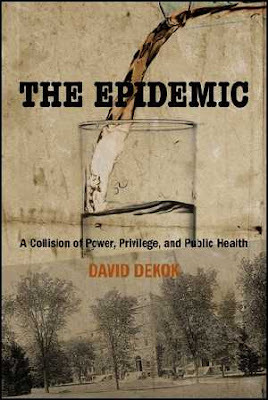 The Epidemic: A Collision of Power, Privilege, and Public Health by David DeKok tells the story of how a vain and reckless businessman became responsible for a typhoid epidemic in 1903 that devastated Cornell University and the surrounding town of Ithaca. Eighty-two people died, including twenty-nine Cornell students. Protected by influential friends, William T. Morris faced no retribution for this outrage. His legacy was a corporation—first known as Associated Gas & Electric Co. and later as General Public Utilities Corp.—that bedeviled America for a century. The Three Mile Island nuclear accident in 1979 was its most notorious historical event, but hardly its only offense against the public interest. The Ithaca epidemic came at a time when engineers knew how to prevent typhoid outbreaks but physicians could not yet cure the disease. Both professions were helpless when it came to stopping a corporate executive who placed profit over the public health. Government was a concerned but helpless bystander. For modern-day readers acutely aware of the risk of a devastating global pandemic and of the dangers of unrestrained corporate power, The Epidemic provides a riveting look back at a heretofore little-known, frightening episode in America’s past that seems all too familiar. Written in the tradition of The Devil in the White City, it is an utterly compelling, thoroughly researched work of narrative history with an edge. David DeKok is the author of Fire Underground: The Ongoing Tragedy of the Centralia Mine Fire (Globe Pequot Press), which previously appeared as Unseen Danger. A former award-winning investigative reporter for the Patriot-News in Harrisburg, Pennsylvania, he has been a guest on Fresh Air and The Diane Rehm Show. The New York State Barn Coalition and Historic Ithaca will present the 12th Annual Conference on the Preservation of Historic Barns on October 24. This conference, open to anyone with an interest in historic barns and their preservation, will be held at Ithaca Foreign Car Service, 501 West State Street. Built in 2006, this new timber frame building houses an auto shop in the heart of downtown Ithaca. For his contribution of this extraordinary building to the downtown streetscape, owner Dave Brumsted is the recipient of a 2007 Pride of Ownership award from the City of Ithaca. A copy of the conference agenda is online via pdf. Late registration deadline is 12pm tomorrow October 22- the cost for the conference is $40. Contact Kristen Olson at (607)273-6633 to confirm that space is still available.